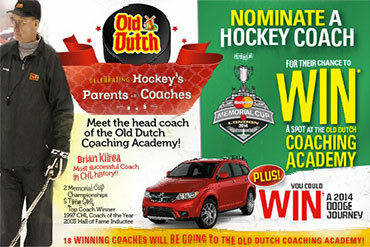 Hockey parents from across Canada nominated their favourite and well-deserved minor hockey coaches at olddutchfoods.ca. A panel of judges from the CHL and Old Dutch chose the 18 very deserving coaches by judging the essays that were included with each nomination. And every valid entry was eligible to win a 2014 Dodge Journey. The entries were judged by region; there are six winners representing the West, six from Central (Ontario), and six from the East. The Old Dutch Coaching Academy is unique opportunity, led on the ice and in the classroom by Brian Kilrea, the most successful coach in CHL history. Kilrea led two Memorial Cup championships, is a five-time OHL Top Coach winner, 1997 CHL Coach of the Year, and 2003 Hall of Fame Inductee. Brian will be flanked by Stan Butler, Director of Hockey Operations & Head Coach of the North Bay Battalion, and Matt Rabideau, Assistant General Manager & Director of Player Development, also with the North Bay Battalion of the OHL. The Old Dutch Coaching Academy takes place at London City Chrysler Rink at Western Fair District, home of the London Knights of the OHL, on Saturday May 24, 2014. All eighteen of the winning coaches will also attend the final championship game of the 2014 MasterCard Memorial Cup on Sunday May 25. The Old Dutch Coaching Academy event will be covered by Sportsnet and developed into a video package that will be featured in Sportsnet’s pre-game coverage of the Final game on Sunday, May 24, on the video board during the Final Championship game, and in the Sportsnet Connected Prime program that night after the game, as well as the Old Dutch website and Facebook page. As a proud title sponsor of the Canadian Hockey League, Old Dutch Foods remains committed to supporting Canadian communities and active lifestyles.